Soon after graduating from Queen’s University in Kingston, Ontario in 1937 with a B.A. 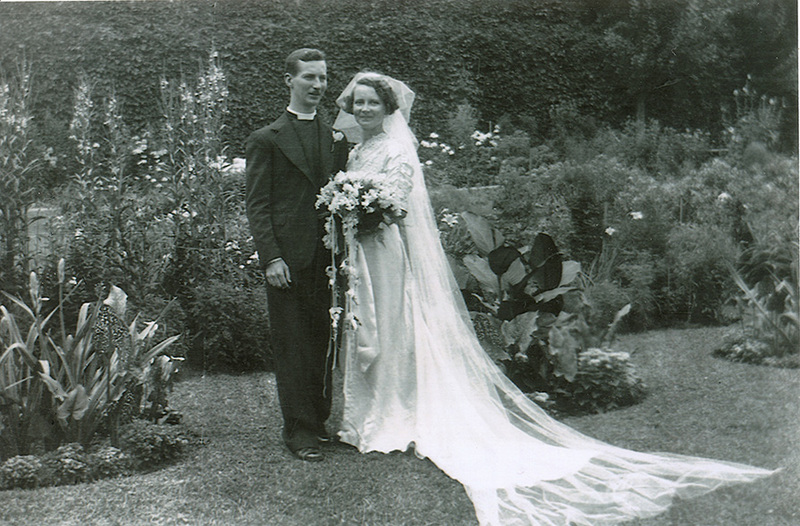 (Honours) in English and French, Betty Rice married Reg Savary (B.A., University of Toronto; L.Th., Wycliffe College) in Barre, Vermont on August 10, 1937. 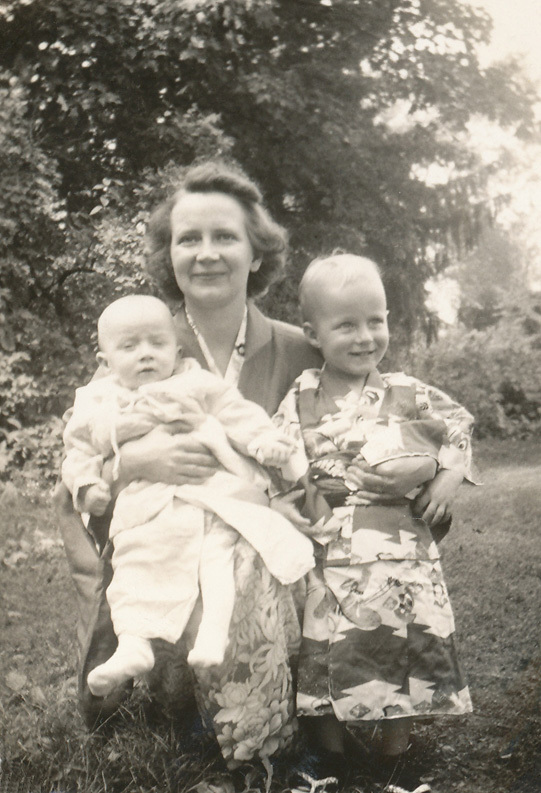 Shortly before my mother’s final exams, my father had told her of his decision to become a missionary in Japan, and in her own words, this had affected her concentration “just a wee bit”. They left for Vancouver by rail on their wedding day, and from there, sailed on the S.S. Empress of Russia for the port of Yokohama. After their arrival, they immediately began a twelve month program of studying Japanese language and culture, which would continue throughout the thirteen years in total that they lived there. Following their stay in Yokohama, during which time my older brother was born at St. Luke’s hospital in Tokyo, they moved to Niigata for a year, and then on to Takata for another. My father’s last pre-war posting was located in Obuse where he was appointed Chaplain at the Obuse Tuberculosis Sanitorium (New Life Hospital). Staying in Japan became increasingly difficult for them, however, and for Japanese Christians because of actions taken in the Far East by the military regime during the years leading up to that country’s declaration of war against the Allies. When missionaries were withdrawn in late 1940 because of concerns for their safety, my mother, father, and brother Jim sailed back to Canada on the Japanese ocean liner, N.Y.K. Hikawa Maru. In response to Japan’s surprise attack on Pearl Harbor, our federal government uprooted approximately twenty-two thousand Canadian citizens of Japanese descent, denied them their civil liberties, and excluded them from the B.C. coast, sending them to prison camps in the interior of the province as well as to other sites as far away as Angler, Ontario. These policies were clearly racist in origin, in that Italian Canadian families and German Canadian families did not have to endure similar mass relocations or losses of property at the time. Yet this was not the first time the Canadian government had mistreated its civilians; during WWI, with the enactment of the War Measures Act, approximately five thousand Ukrainian Canadians had been imprisoned at twenty-four internment camps across the country, including one in Vernon, B.C., and another in Spirit Lake, Quebec where eighty-one women and one hundred and fifty-six children were interned along with the men. In 1942, my parents moved to British Columbia so that their knowledge of Japanese language and culture could be used in support of the evacuees who had lost their homes and livelihood on the West Coast. In this way, they were able to minister to, and advocate for, Canadians of Japanese ancestry who were living under harsh conditions imposed on them by the provincial and federal governments. After arriving in Salmon Arm, B.C. (my birthplace) with my mother and two brothers, my father made frequent visits to Japanese Canadian families living in the so-called “self-support” settlements in the area. He also travelled to the road camps in the mountains between Sicamous and Revelstoke where young men and fathers from those families were being employed as forced labour. In December 1944, my father was transferred to New Denver, B.C. for an additional two years of service among the Japanese Canadians imprisoned there. Then in 1946, with the forced dispersal of internees east of the Rockies, my parents and family returned to Ontario. As you might imagine, I’ve always been deeply moved by the writings of Joy Kogawa and other Canadian authors of Japanese descent who so poignantly and sensitively described their experiences of the internment and dispersal in both fiction and non-fiction. It’s important that our government’s role in this mistreatment of its citizens be remembered and acknowledged by Canadians of every age, so that it not be repeated in the future. I hope you will visit my Reader’s Library page on the above Menu for a list of books on this subject that were written specifically for children and young adults. 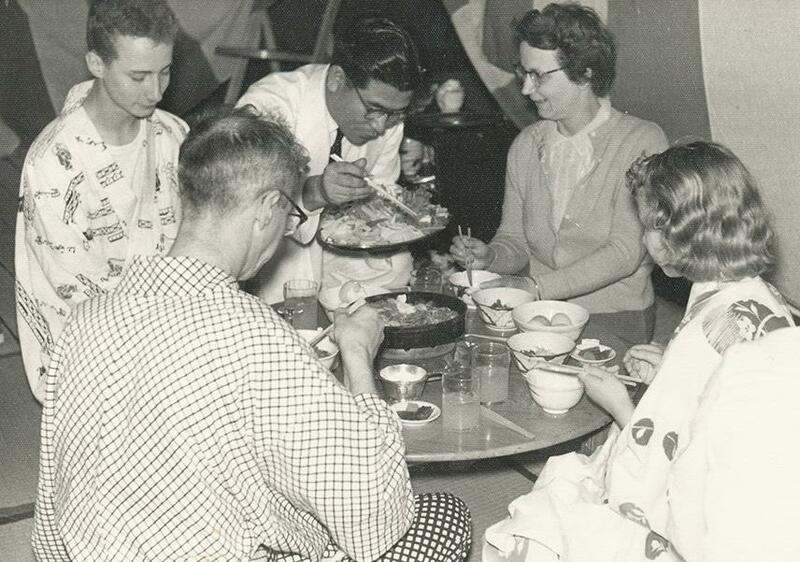 Twelve years after leaving Japan, my mom and dad returned there in 1952 with our family. For this reason, my formative years were spent growing up in that country. My sister and I spoke Japanese fluently with our playmates and with each other during the years we lived in Tokushima City on Shikoku Island. My two brothers attended Canadian Academy in Kobe at that time, and we always anticipated, with excitement, their return home for the holidays. In subsequent years, while they were studying at universities in Canada, I thoroughly enjoyed my own boarding school days as a high school student at CA. My sister, too, was able to experience a year of dorm life before my family pulled up our Japanese “roots” and returned to Canada for good in 1962. After our return to Canada from Japan in 1962, my mom and dad continued to keep in touch with many of the Japanese Canadian families whom they’d first met in B.C., and others they had come to know for the first time while living in southern Ontario. Throughout the remainder of their lives, they continued to treasure the long-lasting friendships that had formed and developed over the years. In late 1989, representatives of the Japanese Canadian community nominated my dad for an Honourary Doctorate in recognition of his service to them during the war, as well as after it. He accepted this honour with pleasure and humility at the 1990 spring convocation of his alma mater, Wycliffe College, in the presence of his proud family, supporters and friends. It occurred to me today that the ship my family had sailed on from Kobe to Vancouver in 1957 was the same one that my mom, dad, and brother Jim had taken when leaving Japan seventeen years earlier in November 1940. In its early years, following its launch in 1929, the Hikawa Maru had acquired the nickname “Queen of the Pacific” because of her reputation for excellent service and fine food. I wish, now, that I’d known more about this ship’s history before we boarded it in Kobe. For instance, I recently learned that hundreds of Jewish refugees escaping Nazi persecution in Europe had fled to safety in North America via Japan, and that many of them had traveled here on the Hikawa Maru in 1940-1941, just prior to Japan’s entry into the Second World War. I learned, too, that in the week before Japanese military extremists attacked Pearl Harbor, a dockyard in Yokohama had begun the work of converting her into a hospital ship. By the end of the war, the Hikawa Maru was only one of two former Japanese passenger liners to have remained intact, in spite of damage incurred from three separate incidents involving mines. The following are photographs taken by my parents during the summers of 1939 and 1940 at Lake Nojiri, Japan where they owned a summer cottage (pictured below) before the war. It was confiscated by the Japanese government, but returned to them during the American occupation. As a child and teen, I spent every July and August with my family at that wonderful lakeside community. Traditional Quill Work, circa 1952, presented by the Mohawk women of Tyendinaga to my mother as a parting gift–photographed by my sister Pat. Returning to Ontario from British Columbia in 1947, my father was asked to be a liaison between Japanese Canadians and the communities to which they had relocated. He travelled around the province for the first six months, during which time my siblings and I and my mom remained in Grafton. 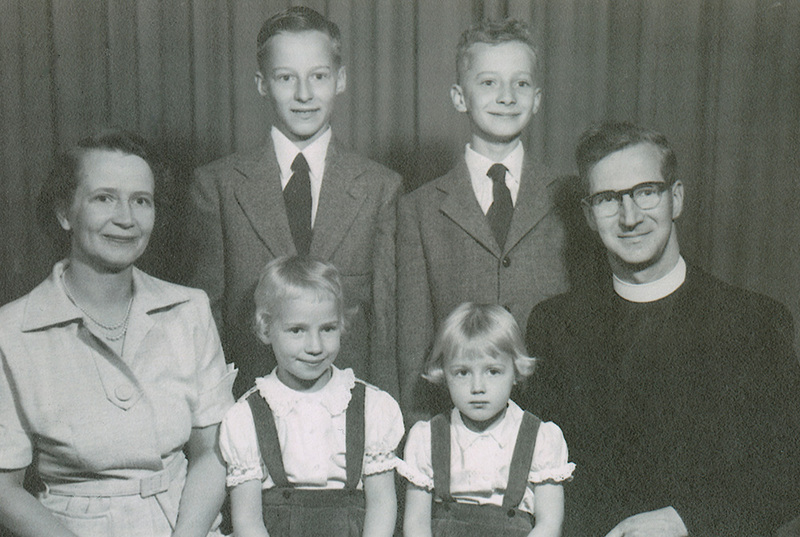 Since this arrangement was difficult for all of us, in the latter half of the year my parents were sent to live and work in the Parish of Tyendinaga. Here is an excerpt from their Christmas newsletter: … the parishioners are all Mohawks, descended from those who came here from their old homes in the Mohawk Valley of New York State as loyal allies of the British after the American Revolution…. The Reserve lies on the shores of the Bay of Quinte, a beautiful arm of Lake Ontario. My son Ken wrote and illustrated a Christmas story based on his uncle’s memory. He was eleven years old at the time. Some of my earliest and happiest childhood memories took place on this reserve. I’ll never forget how excited I was when my father arrived home with an old wooden children’s sled that he planned to give to my brother Tom for Christmas. He let me in on a secret! He had asked Edith Green, a member of the young people’s group, to paint a scene on it. Because my dad and two brothers were avid fans of model trains, that is what she chose to do. The background was forest green, and an image of a train, it’s locomotive perfectly executed, travelled a set of tracks running down its centre. When my brothers sped down the steep hill of the field that lay between the church and the rectory, they must have travelled at record speed! In his 1962 Christmas Newsletter fifteen years later, my dad said that of the three congregations he was responsible for in his new posting, one was Oneida–part of the Six Nations–and one was Chippewa. These two congregations also included some people from the Muncee-Delaware First Nation. My father ended his 1965 Christmas Newsletter with the following words: On the Reserve the little group who are devout and devoted are a great joy to us… In it he also mentions the young girl who had painted my brother’s sled eighteen years earlier: Edith Green, who was in our young people’s group when we were at Tyendinaga, is doing post-graduate work at the University of Western Ontario, and it is a joy to have her visit us quite often. We are very proud of her and what she has accomplished. Although these two experiences of ministry [the Tyendinaga Reserve and the Reserves in the Delaware, Ontario region] were separated by the nine years my parents lived in Japan, I know my mom and dad never stopped being concerned for the welfare of indigenous peoples in this country. My brother Tom tells me that the Tyendinaga rectory is no longer standing, but he very kindly brought me a stone from its foundation. It now resides in the waterfall that my husband created in the backyard as part of our personal “millennial project”. December 28, 2013 at 2:51 -03:00.Dec. Did you know that the summer cottage was previously owned by Charles McLean Warren (1876-1951) and Cora Frances Keith-Warren (1873-1954)? Your parents’ purchase ($1000 was the sum mentioned) allowed my grandparents to take an unexpected trip to the US in the summer of 1939 and bring back to Japan their daughter-in-law while their son began his job in Venezuela. In October of 1940 my grandmother wrote. “We are sorry for the Savarys, who bought our house and enabled us to have that wonderful trip, and now must leave it and we cannot imagine their being able to sell it, not to say for what it is worth, but for any price, at least in the present time of uncertainty. It makes us feel selfish to be glad we sold when we did.” They would have been glad to know it was returned after the war. Thank you for filling in a bit of their history. December 29, 2013 at 2:51 -03:00.Dec. Thanks so much for passing this information on to me. No, I didn’t know that my mother and father had purchased the cottage in 1939 from your grandparents, the Warrens. Had they known, I’m sure my parents would have appreciated your grandmother’s expression of concern about the timing of the transaction. Her relief at having sold it when she and her husband did is quite understandable! I’ll let my siblings know about this, as I’m sure they’ll be very interested. Once again, thank you. April 27, 2014 at 2:51 -03:00.Apr. These pictures bring so many memories to mind of Nojiri. We were really blessed to have been there. I agree. I’d love to see the pictures taken by my late father during the summers my sister, brothers and I spent there, but the slides are now stored at the home of one or more of my siblings in Ontario. Maybe I’ll get a chance to look through them on my next visit. September 13, 2014 at 2:51 -03:00.Sep. I only today remembered–just a day before we leave for our visit with you–that you had told me that you had a website. I’ve been happily reading it instead of packing my suitcase. Your family memoir is fascinating and engagingly written. Jim has a difficult time remembering dates and events so your memoir offers a real insight. While helping Jim sift through his belongings I found letters that your Dad had written from Japan. I will bring them with me. I don’t think Jim has any photos/slides but there are still many boxes piled up in his office–there may be more treasures buried there. September 19, 2014 at 2:51 -03:00.Sep. Thanks, Jenny. The letters you and Jim delivered have added to my knowledge of Savary family history, and to my understanding of my mom and dad and how they felt about living in Japan during that time of political turmoil. Their comments on how we “children” were coping with the frequent moves were enlightening, too. Dennis and I hope you’ll both visit us again soon! October 12, 2016 at 2:51 -03:00.Oct. Great job on the above! Could you possibly revise it to include the years when they worked with the indigenous people on the reserves in Deseronto and Delaware? November 22, 2016 at 2:51 -03:00.Nov. Please feel free to make suggestions for editing. I found very few references to the years 1947-1952 in Dad’s annual newsletters and reports. I needed a photo, so I asked Pat if she would to take one of the quill-work that was presented to Mom. (Good job, Pat!) It’s posted here along with the write-up. January 20, 2017 at 2:51 -03:00.Jan. Peggy, this section about your family history is very engaging! The stories you share are really beautifully rendered and the photos to accompany them are so evocative of that era/time. Well done! I’ve enjoyed these pages. Your whole blog is artistically put together. I feel like I’ve had many good meals here, it’s that sort of satisfaction! January 22, 2017 at 2:51 -03:00.Jan.